(1) Culvert, bellows culvert, steel corrugated culvert, Metal Corrugated Culvert have strong adaptability to foundation deformation, low requirements for foundation bearing capacity and flatness, and the actual project cost is similar to or lower than similar span Bridges and culverts. (2) Short construction period is the most obvious advantage, civil engineering and pipe joint installation can be implemented separately. (3) Centralized factory production, which is not affected by the environment, is conducive to cost reduction and quality control. (4) Culvert, bellows culvert, steel bellows culvert, metal bellows culvert site installation is convenient, do not need to use large equipment. (5) Solve the problem of damage to Bridges and concrete structures of pipe culverts in cold regions (frost) in north China. (6) Reduce or completely abandon the use of conventional building materials, such as cement, yellow sand, stone and wood, which is of far-reaching significance for environmental protection. 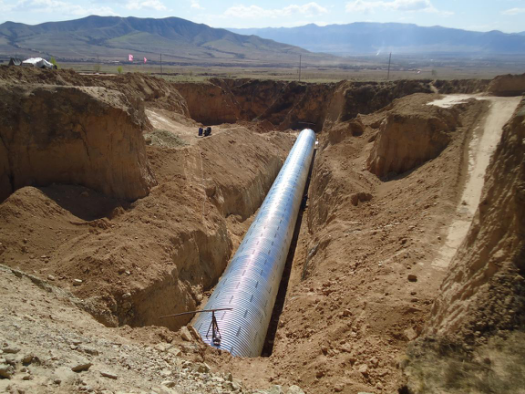 (7) The structure of culvert, bellows culvert, Steel Corrugated Culvert, metal bellows culvert under reasonable stress, load distribution is uniform, and has a certain ability to resist deformation. (8) Culvert, bellows culvert, steel bellows culvert, metal bellows culvert use standardized design, production, design simple, short production cycle. (9) Corrugated culvert pipe is conducive to improving the "wrong platform" phenomenon at the junction of soft soil foundation structure and embankment, improving the comfort and safety of driving, and reducing post-construction operation and maintenance costs.